Love chicken. To me chicken is like a painter canvas, the opportunities are endless on how to prepare it. Last nights dinner had all the perfect combinations: easy to prepare and cooking the potatoes with it. Any herbs will do, I always have in hand fresh rosemary and thyme. You may want to try oregano, marjoram…. For the potatoes add as may as you wish making sure that there is plenty of water during cooking so they will not dry out too much. 1. Preheat oven to 350°. Season the chicken all over with salt and pepper. Place the chicken, skin side up, in a roasting pan and scatter the potatoes, garlic and bay leaves all around it. 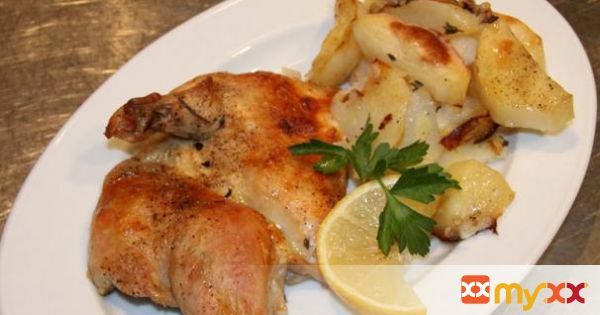 Drizzle with the lemon juice and the olive oil all over the chicken and potatoes. 2. Season with rosemary, thyme, salt and pepper. 3. Pour ½ cup water into the pan. 4. Roast in the oven for 40 to 45 minutes or until the chicken is cooked through and it is nicely golden. 5. Transfer the chicken to a work surface and split into 4 pieces. 6. Discard the bay leaves, rosemary and thyme springs. 7. Serve with the potatoes, garlic and any pan juices.